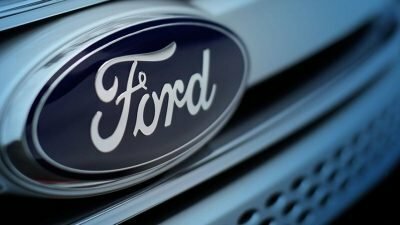 Over the past 113 years as a company, Ford has encountered tremendous success, as well as notable failure. The reason that they have continued to be a leader in the automobile business is that they take risks that others won’t. In doing so, they change the future of trucks and car dealerships in Lakeland, FL and throughout the world. Today, Bartow Ford wants to discuss a few of the ways Ford’s innovation has led and will continue to lead to better vehicles for all of us. Ford engineers are coming up with sometimes crazy-sounding ideas to implement recycling into the manufacturing process. They’ve been able to recycle jeans and T-shirts to make door panels and plastic bottles for carpets and wheel liners. Ford is the first automaker to use a hybrid fiber made from recycled plastic water bottles and post-industrial waste called REPREVE® for seating fabric. Their creative approach is helping protect our planet and keeping materials out of the landfill. Ford has supported electric vehicles from the get-go and is heavily invested in their success. They understand that the energy harvested to power these plug-in vehicles comes from emissive coal power plants that do more harm to our environment than our cars and trucks do. They are focusing on improving our source of energy and building a more responsible future. Through the development of more efficient engines, Ford has been capable of building vehicles that get more miles out of your fuel, while still providing the power we’ve come to expect. Their innovative research into greater fuel technology is helping to conserve fuel for the entire world. As leaders in the industry, Ford is implementing massive task forces to develop safe and reliable self-driving vehicles that may not even have pedals or a steering wheel. Their vision is to one day make these vehicles available for everyone to share, much like carpooling today. Ford means serious business when they think of the future of car dealerships in Lakeland, FL. 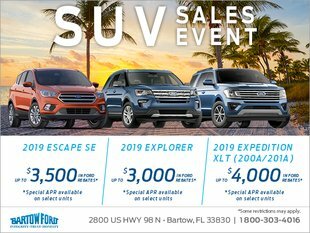 Their goal is to provide more for their consumers, which is why Bartow Ford goes the extra mile for every customer. Take a look for yourself by visiting our location on 2800 US HWY 98 North, Monday through Saturday, or online 24/7!